It has always been my goal, from the days of The Marine Aquarist, through Aquarium Frontiers, to The Advanced Aquarist Online to publish cutting edge information for all aquarists, but especially for both amateur and professional experienced aquarists. A glance at our regular columnists – Julian Sprung, J. Charles Delbeek, Scott Michael, Rob Toonen, Doug Robbins, Greg Schiemer, Martin Moe, Randy Holmes- Farley, and Frank Marini – makes it clear that we have assembled a significant number of the best in our field. The author’s Stylophora sp. has grown to the size of a basketball from a small fragment over the last 10-years. Our Feature writers continually offer new research into animal husbandry, and scientific examinations of the equipment we use to keep our guests healthy and thriving. In this regard Sanjay Joshi has done extensive and invaluable research into sources of illumination our photosynthetic organisms require and that we provide – from the actual characteristics of bulbs and recently the reflectors we put them into. It has always been my belief that the more we know about our hobby the better we serve the fauna and flora we maintain in our captive environments. Also, the more we understand the more enjoyable our hobby is to us. 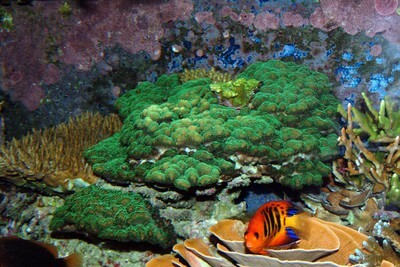 A scuba diver approaching a patch reef underwater sees a dark mass. As the diver swims closer details of the living reef become apparent, and still closer the behavior, patterns, and coloration of the wild life is clearer still. However, the complex biology of the reef is only apparent to the educated observer, and it’s the educated observer that recognizes the most and receives the most pleasure. It has always been our goal to provide the tools of inquiry and information to enhance our husbandry skills and our satisfaction with our hobby. With this in mind I’d like to ask our readers for feed-back about what they like, dislike, want to see more and less of, and any other way that our publication can better suit their needs. Aquarium Invertebrates: A Creature From Outer Space Or A Hydroid For Liberace’s Piano?